Now that the dust (and confetti) has settled from the College Football Playoff National Championship, we can circle back around to the matter at hand: who had the best catch of the 2015 season? Your votes throughout the season helped us narrow things down to a final 10: Aaron Burbridge (Michigan State), Demarcus Ayers (Houston), Fred Ross (Mississippi State), Austin Wolf (Akron), Francis Owusu (Stanford), George Kittle (Iowa), Kenny Golladay (Northern Illinois), Shamier Jeffery (South Carolina), Amara Darboh (Michigan) and Thomas Sperbeck (Boise State). Boise State fans came out in full force to support their guy, as Sperbeck brought in a whopping 82 percent of the votes to win our tournament. 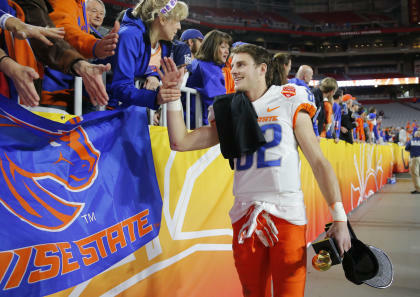 Sperbeck had a huge junior season for the Broncos, leading the Mountain West with 88 receptions for 1,412 yards. He also had eight touchdowns. He showed his great athleticism and hands with this Week 8 catch against Wyoming. He used every bit of his frame to stretch out and tip the Brett Rypien pass up to himself. He then corralled the ball with only his right hand while getting both feet inbounds. Now Sperbeck will have the chance to defend his crown when he returns for his senior season in 2016.